LCOPY.EXE is a simple Windows console application that can save significant amounts of time when multiple identical sections of a schematic need to be laid out identically on the PC board. It will automatically place components at offsets that mimic the relative positions of similar components already on the board. LCOPY can be downloaded here. This zipfile includes .cpp sources and a makefile compatible with Visual C++. To rebuild LCOPY.EXE, you can use either the Enterprise or free Community edition of the Visual Studio package, configured to enable command-line compilation. LCOPY is compatible with XML schematic and board files written by EAGLE V6 and later versions. In addition to its ability to help with repetitive layout tasks, it's hoped that LCOPY will also serve as a useful example of EAGLE XML file access in C++. 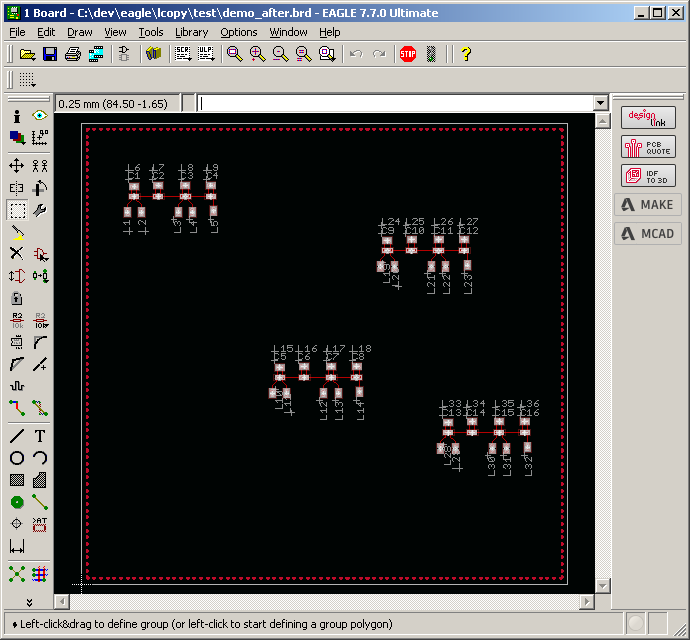 The current version of LCOPY can duplicate placed components, silkscreen names, routed traces, polygons, and vias. Any patches and improvements are (very!) welcome. 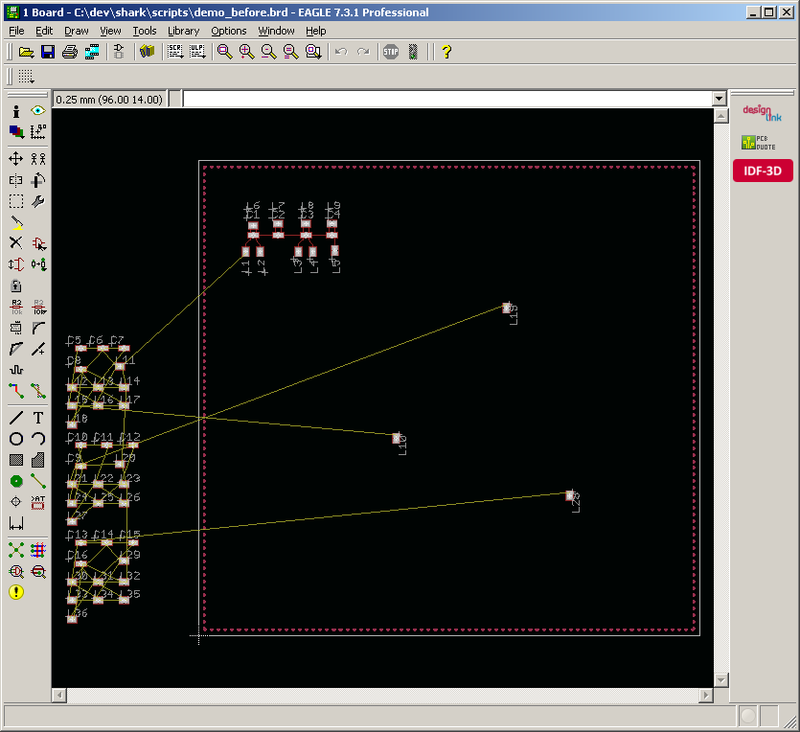 corners of the desired area of the schematic sheet in layer 97 (Info). 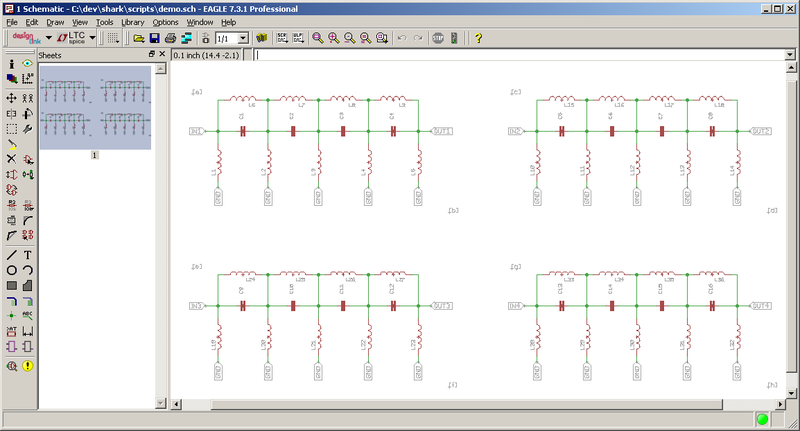 If no tags are specified, all parts on the schematic sheet are processed. on the reference sheet is applied to all other target components. - Back up your .brd file first! Note the addition of the [a]...[h] text tags in layer 97 (Info). In the example below, LCOPY will use the tags to identify the subset of components to be used as a placement reference ([a][b]) for the other three copies ([c][d], [e][f], and [g][h]). Above, the components from the [a][b] section have been pre-placed by the user, along with one 'anchor' component from the [c][d], [e][f], and [g][h] regions to be copied. For each component in the [a][b] region, LCOPY will identify the closest component in the other three regions and move it to a similar offset relative to that region's anchor component. The following three LCOPY commands will perform the necessary component placements, saving the final result to demo_after.brd. User commands are highlighed in red. Loading demo_after.brd into EAGLE, followed by a RATSNEST command to recalculate the airwires, will yield the above result.